You can check on your system by using the MyEnlighten online monitoring system. MyEnlighten displays a status-at-a-glance icon in the top left corner of your log in page to help you make a quick assessment of your system's status. Good news! When you see a green checkmark icon, it means that your system is operating as expected. The orange Wi-Fi icon means that your system is not currently reporting to MyEnlighten. Follow the "Click here for help" link in MyEnlighten for guidance on how to fix the problem, or go here for help on how to fix this issue. The orange microinverter connector icon indicates that one or more of your microinverters is not communicating with the Envoy. Follow the "Where's the problem?" to find out which microinverters are impacted. Go here for additional help on how to fix this issue. The orange lightning bolt icon means that MyEnlighten has detected a production problem with your system. Go here for help on how to fix this issue. If you have a question that isn't addressed by the common system status errors above, try searching our Troubleshooting site for answers to common questions. If your issue requires the help of a technician or service provider, continue on to the Find a Service Provider section below. Your solar installer is your service provider for system inquiries and maintenance. You can access your installer’s contact information in MyEnlighten in the upper corner of your login screen. 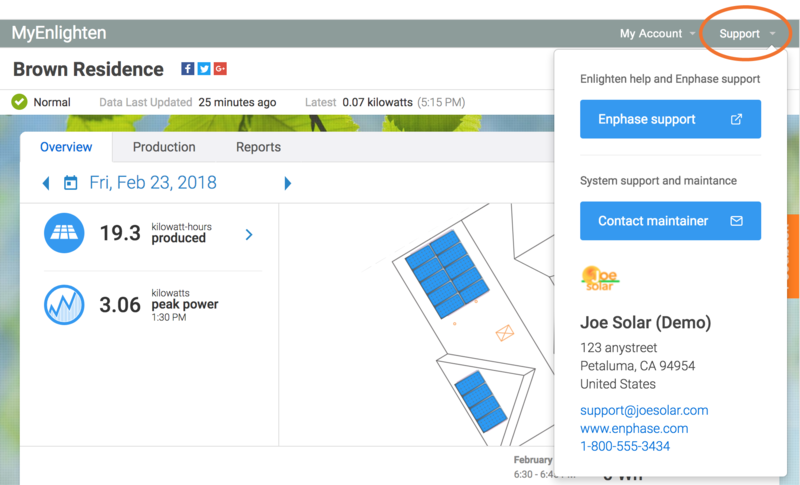 Click on the Support drop-down to display your installer's contact information and a link to Enphase support. You can also access your installer's contact information by clicking through on a reported error. If your solar installer has retired or is no longer in business, visit the Enphase Installer Network to find an installer in your area. You can also find answers to frequently asked questions in Homeowner Support.